« How is your “success” making you fail? If you have a one dimensional view of psychiatric and neurological issues, this book could be a gentle introduction into how complex diagnosing someone can be. Compassion for someone going through neurological struggle. The enjoyment of a fast paced, info packed, non-fiction story. Time to Read: I completed the text in about a week, reading a chapter or so each evening. Pages & Highlights: 290 Pages. 33 passages caught my attention as worth highlighting. The first 75% of the book is a fast paced story told by Cahalan as her life is turned upside down and shaken out by the illness overtaking her. In the last 25% Cahalan switches gears and reflects on her experience and how it had changed her perspectives on medical care, and new connections it had afforded her with people going through similar health scares. Thesis: Don’t toss around the term “crazy”. Cahalan’s description of the book on YouTube, approximately 4 minutes. I think the book is a great example of the need for patient advocacy. It describes that need through a gripping story with energy that pulls you along. There was also a challenge for me around how I think about, or don’t think about, people with mental or neurological disorders. I took it as a gauntlet to be more humbly compassionate about the complexity of these issues and how I might interact with someone if they have or did have a disorder. This book is a chance to walk in a pair of shoes that you did not even know existed. When reading a book I’m constanting looking for notable excerpts that challenged my thinking and present the freeze dried goodness of the text. One of the elements I think you will enjoy a lot about Cahalan’s writing is the insertion of researched tidbits throughout the narrative. It takes the story from being entertainment to high quality edutainment. One of the fascinating images Cahalan describes to give us a taste of what it was like to have the illness and how it skewed her perception of reality. Reading these almost other-worldly descriptions felt like a neat behind the scenes treat. It’s a great example highlighting the value of getting second opinions. 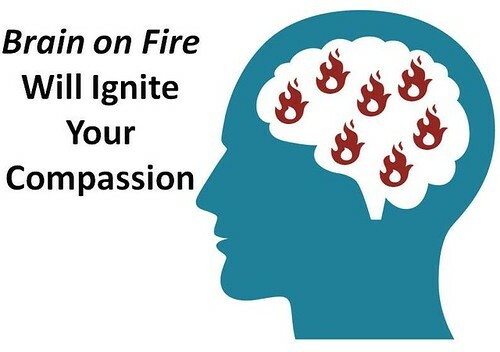 Brain on Fire is a great example of how our lives can depend on being in the driver seat of our medical care. Having read Cahalan’s description of her illness, and seeing the frothing sentiments she couldn’t express, I was challenged in how I regard individuals with neurological issues. When I try to converse with an individual with neurological issues, I feel nervous and unsure of myself. Which is selfishness. The challenge is to lean towards someone in a mental space that hard for me to fathom out of compassion, rather than being arrested by selfishness.